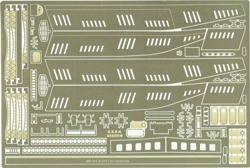 Enhance your Moebius Models' 1:128 scale Seaview model with this extensive set of photo-etched details. At over 150 pieces, this is the ultimate upgrade to an already amazing kit. Made of 0.010" brass. Please note that some features of this kit may require advanced modeling skills. Thank you Gary Kerr and David Merriman for providing invaluable research and encouragement during the devlopment of this product, and to Dave Metzner of Moebius models for excellent suggestions on items to be included. Gary's photo and drawing archive was of immense help and this project wouldn't have been nearly so complete or accurate without it.